Once it’s broken, it’s trash, right? Well, not if you have enough scrapped pieces to turn into sculptures. 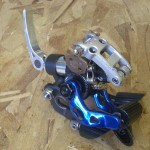 My local bike shop saves their broken components for me, and I turn them into art. 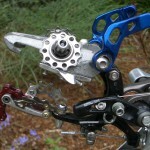 Visit Pacific Bicycle Company in Sammamish, WA to see some of the sculptures face-to-face. Old ONZA brake calipers make amazingly adjustable legs. His body is the swingarm from some full suspension bike. His arms are from mechanical disk brake calipers. See a larger version of the dinosaur. 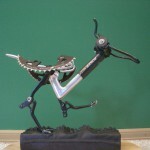 I saw a broken SRAM derailleur and immediately envisioned this whole sculpture. The hard part is making everything stick together – you’ll notice that there are no welds – everything is bolted or clamped. See a larger version of the puppy sculpture. This was my first and last commission piece. I’m too attached to these things after I’ve made them to then go around selling them. Also, I can’t work to a timescale because I have to wait for animals to suggest themselves from the broken components I have. I fell in love with this guy even though I knew he was going to a different home when I started him. Sticking with the bike metaphor, this dragon’s jaws, head, wings and tail are controlled by brake levers and gear shifters attached to a mini-handlebar on his stand. 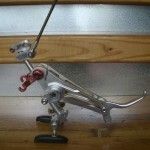 He sits on the counter in a bike shop and the staff can animate him for customers’ entertainment. See a larger version of the dragon, and a video. Thanks to MAKE Magazine for blogging about this site! If you like what you see, let me know.